Melt the semisweet chocolate over a double boiler (or in 30-second intervals in the microwave on 50% power, stirring after each). Spread the chocolate mixture onto the prepared pan in an even layer (depending on the size of the pan and how thick you’d like your bark, you may not need the entire surface of the pan). Refrigerate for at least 30 minutes, or until set. Melt the white chocolate over a double boiler (or in 30-second intervals in the microwave on 50% power, stirring after each). Whisk the cake mix into the melted white chocolate until it's smooth and no lumps remain. Let it sit for about 3 minutes to thicken slightly. Remove the pan of semisweet chocolate from the refrigerator and pour the white chocolate over top. Use an offset spatula to spread the white chocolate evenly over the chocolate below. 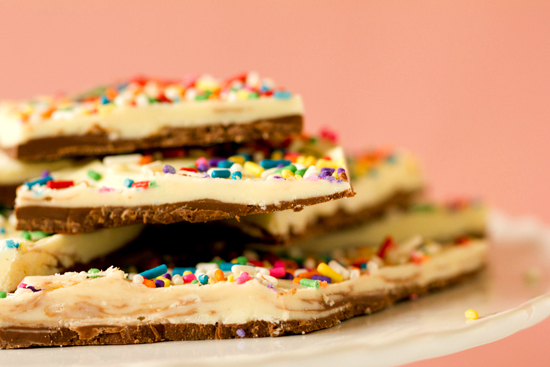 Immediately sprinkle the rainbow sprinkles on the surface of the white chocolate. Return the pan to the refrigerator and allow to set for at least 30 minutes, up to 1 hour. Once set, use a sharp knife to cut into pieces or break apart. Store the bark in an airtight container in the refrigerator.